Umm, not much to say about this. The offset colors I’m using in the backgrounds on all of these is something I’m swiping from old Looney Tunes shorts. I think it’s a Friz Freleng mannerism, but I’m not positive. Anyone? These guys are pretty cool. Not sure what’s gooing on with Mikey though. I’ve always like that offset color style… it ads a little something extra to minimalistic (is that a word?) “cartoony” styles. I think it sorta gives the piece depth and makes it feel a bit more surreal or something. WTF?! 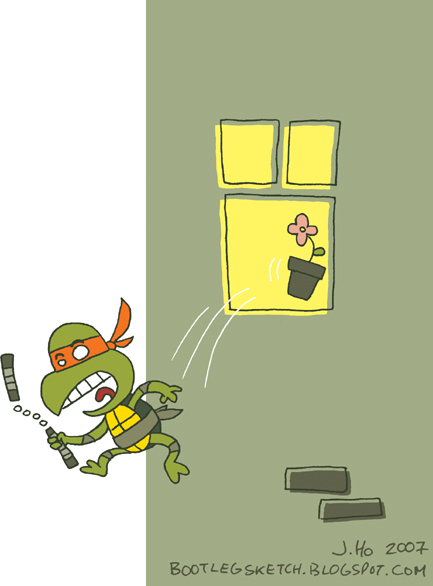 Did that flower just shove Mikey out the window?! TURTICIDE!!!! (Makes me think you need to do a TMNT and Mario Bros. cross-over). I think the off-set lends a certain feel of the hand-drawn and ‘intimate’ *waits for you to stop snickering*… done? ok… it lends a hand-drawn effect to a piece that largely wasn’t, which is why i’ve also stressed sketching and ‘sketchiness’ to you because the overly polished styles are so in style it’s BO-RING and no one can be you nor truly ever replicate your hand-drawn stuff. so in conclusion: that’s why some dinosaurs ate meat while others ate gravy. jamilyn– mikey was drawn with 2 possible scenarios in mind–either he’s yelling “banzai” as he assaults some foot soldiers below, or he just fell while goofing off. charles– i have to say i disagree with the “polished vs. not polished” argument. you gotta go with your own style, regardless of what the current trends are. boring or not, going against the current trends just for the sake of being (falsely) different is just as bad as going along with the trend for the sake of being (falsely) chic. and i think my natural tendency is definitely towards polished.